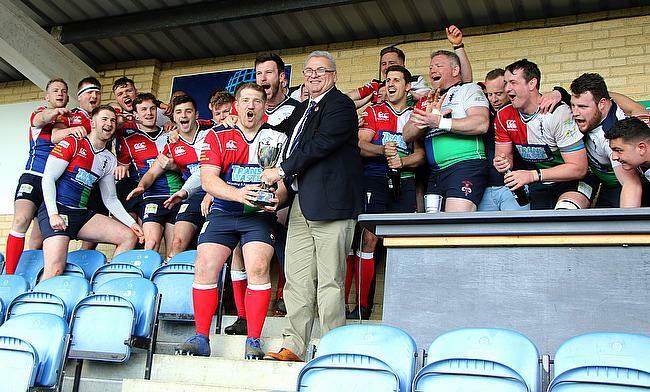 Hull Ionians have been promoted to National One after clinching the National Two North league title against Leicester Lions. Martyn Wood’s side suffered relegation from the third tier 12 months ago, but the I’s will now be back in National One next term. They could be joined by Chester who sealed the play-off spot in Round 29 after a comfortable win over Otley and Jan van Deventer’s side will take on Canterbury on May 4th for a place in National One. Elsewhere in National Two North across the weekend, Huddersfield beat Wharfedale and Sedgley Park maintained their excellent form at Fylde whilst there were also wins for Tynedale, Hinckley and Stourbridge. Hull Ionians have been crowned champions of National Two North after a battling win over Leicester Lions at Brantingham Park. The visitors held a 22-7 lead after just 23 minutes as Laurence Warren-West (2), Devon Constant and Harry Key all touched down, while James Newman crossed for Hull Ionians. However, another score from Newman and Joe Makin’s effort made the game level before Key nudged the Lions ahead from the tee on the stroke of half-time. But, the I’s blew Leicester away after the break as James Tincknell (2), Lewis Minikin and Mark Wigham all crossed as the hosts went 48-25 in front. An excellent display by the Lions was rounded off by Ed Sumpter’s try, but the celebrations belonged to Hull Ionians as they sealed an immediate return to National One. Chester have secured their place in the National Two play-off as they emerged with a convincing bonus-point win over Otley at Hare Lane. Tries from Harrison Vare and Alick Croft helped the hosts to a 12-0 half-time lead and further scores by Michael Craven, Vare and Tom Foden made it comfortable for Chester. After a heavy defeat to Sedgley Park in Round 28, this was the perfect response by Jan van Deventer’s side who will now face Canterbury for a place in National One on May 4th. Huddersfield battled to victory at Wharfedale, but their faint hopes of sneaking into the top two are over after Chester’s win against Otley. Field led 17-7 at the break thanks to tries from Elliot Spiers, Jack Maplesden and Will Milner, while Harry Bullough crossed for Dale. The home centre scored the only try of the second period as he scooted over on 73 minutes, but Huddersfield held out for the win to stay in third place. Sedgley Park extended their winning run to eight matches with a fine victory over Fylde at Woodlands. Ollie Glasse and Richard Lepori both went over in the first period to give Sedge a 14-0 lead at the break before Ben Black and Hallam Chapman crossed after half-time for the visitors. Fylde were in danger of not getting on the scoreboard, but Warren Spragg’s side produced a late flurry as Sam Dugdale and Ewan Ashman went over for the home side. Fylde have now dropped down to sixth in the table while Sedge are level on points with third-placed Huddersfield ahead of their meeting on the final day of the campaign. Tynedale ran in 10 tries as they crushed Peterborough Lions to move into the top five of National Two North. After a delay to kick-off and a slow start in this encounter, Will Miller crossed for Tynedale’s first try before the floodgates opened at Bretton Woods. Will Montgomery, Will Roberts, Ben Bell, Liam Checksfield and Rob Farrar all scored before half-time to give Tyne a 49-0 lead. Thomas Gulland went over for the Lions shortly after the interval, but Tyne immediately responded as Montgomery grabbed his second. Christian Edbrooke and Checksfield exchanged scores, before Newcastle Falcon Cameron Nordli-Kelemeti went over for Tyne’s 10th try of the afternoon. Peterborough Lions did collect a bonus-point from their final home outing of the season as Nico Defeo scored twice before Allen Carr touched down a minute from the end. Alex Hurst scored three tries as Preston Grasshoppers won a thrilling match away at South Leicester to guarantee a top seven finish in National Two North. Scott Jordan got two touchdowns and Nathan Pope and Luke Proctor also went over for Hoppers, who have scored 139 points in their last three victories. Reece Harris (2) and Javiah Pohe responded with scores for the hosts and South were also awarded a penalty try in the second-half. A late try from winger Callum Dacey ensured Hinckley sealed a narrow home victory over Sheffield Tigers in Round 29. It looked as though Sheffield Tigers had done enough to become just the third side to win at Leicester Road all season following tries from Jamie Broadley (2), Henri Packard and Tom Hart, as well as 14 points from the boot of Mark Ireland. But Rory Vowles, Dacey, Henry Povoas and James Moreton kept Hinckley in the game before the aforementioned Dacey crossed five minutes from time to clinch the victory for the Hornets. Stourbridge scored eight tries against a spirited Macclesfield side in the Midlands, with winger Dan Rundle grabbing a hat-trick for the hosts. Rundle, who has now scored seven tries in his last three games, crossed twice in the first half as Stour led 24-10 at the interval. Noah Heward and Joe Heatley also dotted down in the opening 40 for the hosts and it was Rundle who began the scoring after the break as he sealed his hat-trick. Mark Harrison, Stefan Thorp and Luke Veebel also touched down for Stour in the second half while Macc’s tries came via James Oliver, Sam Broster (2) and James Cross.